While the FPS genre has had many, many titles released under its banner, they’re all essentially the same thing. Run, shoot, jump. F.E.A.R doesn’t pretend to be anything different, and in that respect it’s nothing ground-breaking. The gameplay is medium to fast paced; in some sections of the game you’re walking around inside various facilities, checking out offices and opening doors to see what you can find. In other areas though, you are battling typically two to five bad guys at any given moment. The combat sections of the game are generally medium to short length, equating to no more than a few minutes (or a few seconds if you’re a pro), though the AI is quite “intelligent”, making these short battles quite fun. Enemy soldiers will attempt to flank you, while others lay down covering fire and distract your attention. The odd grenade will be lobbed in your direction, occasionally with deadly accuracy and other times just out of your reach, but still close enough to do damage. The AI itself is quite good in some respects but blatantly stupid in others. Enemy soldiers will, while trying to move closer to you or find cover, slow themselves down by crawling under fallen shelves or hopping over window ledges, allowing for an easy shot and an easy kill. Their ability to avoid grenades is generally acceptable though often it is quite easy to catch a group off guard and land one in the middle, clearing a room in as much time as it takes for the grenade to explode. The addition of special abilities like SlowMo is a welcome change. It can be used quite effectively -- perhaps too effectively – to easily dispense of the odd enemy. I prefer to use SlowMo more conservatively, only when I feel as though it’s required, though I have heard of people who apply the technique on every enemy they encounter. I think this is perhaps the most boring way of playing the game, though I find that even with SlowMo it is still not possible to enter a room full of bad guys and go Serious Sam-style on them by simply blasting everything that moves. You will take damage just as fast as they do, and you will die just as fast as they do. 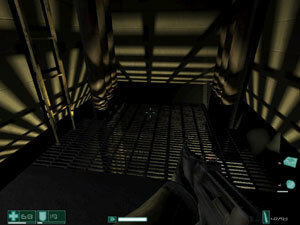 F.E.A.R also incorporates the ability to lean around corners, which is quite handy when you want to hide behind something and poke your head out to take some pot-shots. Once again though, the enemy can do the same, and they do it quite well, which is another credit to the AI. Throughout the game you will also come across stats boosters: they boost either your maximum health or your SlowMo charge (in-game they refer to it as reflexes) permanently. This means you can find yourself at the end of the game with as much as up to 200 health points for the enemy to whittle away, and as much SlowMo as to last the duration of an entire firefight. All in all the gameplay is a solid experience. It’s easily picked up by those unfamiliar with FPS titles and is even easier for those who are. To put it simply: the graphics are good. On my 6800GT I play the game in 1024x768, with most settings on maximum, bar Volumetric Lights (medium) and Soft Shadows (off). I unfortunately cannot play this game with anti-aliasing and this is sometimes distracting, because I've become quite used to the smooth surfaces and rounded edges that 4xAA brings me in titles like Counter-Strike: Source and Day of Defeat: Source. The shadow and lighting system is of particular note simply because it appears to be as good, if not better, than that which you see in Doom III and the recent Quake 4. Now, before anyone e-mails me and tells me about how the D3 engine is far superior, I’m judging what I see as I see it. I’m not at all concerned with how the graphics came to be, I’m merely concerned with the end result, and I would say the end result of F.E.A.R’s lighting system is comparable to Doom III’s. 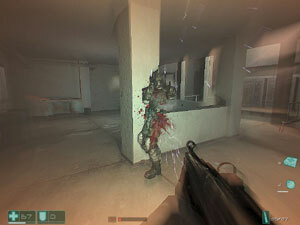 In-game characters and weapons are bump-mapped to great effect, and in combination with the volumetric lighting, appear quite lifelike due to their detail and fluid animation. The particle system in the game is also extremely efficient and detailed. Often in titles based on the Source engine, if you have a few smoke grenades filling your view with smoke clouds, the framerate is generally cut quite substantially and a noticeable slowdown occurs. 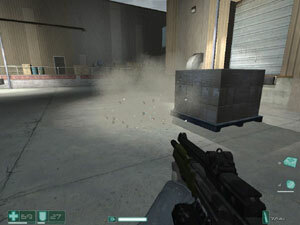 Not so in F.E.A.R; during firefights with enemies, chunks of wall will be dislodged and clouds of concrete dust or torn boxes are thrown in the air. These clouds can become quite thick and varied, and hang around in the air for some time. Indeed, a remarkable particle effect is that of shooting into stacks of cardboard boxes, where the pieces of torn box float in the air, which for me is an immediate immersion factor. The realism behind the particle, lighting and shadow systems synergize to make the graphical experience quite enthralling. However, I believe that the game is let down but its sub-par textures. You will often find yourself seeing the same old blank grey concrete wall, no matter where you are or what you are doing. All of the control consoles and computer terminals have the same look and feel, wooden boxes are all very clone-like, and the textures themselves are not very detailed. Compared to Half-Life 2, the environments in F.E.A.R look like they’ve been rendered using a greyscale colour palette.